Dughet’s classical scenes are different in mood from those of his teacher Nicolas Poussin and the other major Roman landscape painter of the period, Claude Lorrain. He studied in the countryside around Tivoli, producing landscapes just as carefully structured as theirs, but more rugged and varied in their terrain. Here, a track running alongside a river winds up through trees to picturesque buildings. 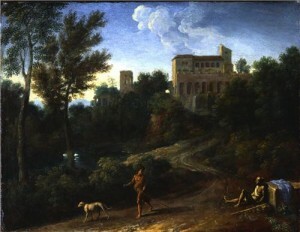 The figures, a traveller and a beggar, are clothed in antique dress suggesting ancient Rome rather than modern Italy.